CD11b+Gr-1+ myeloid suppressor cells (MSC) accumulate in lymphoid organs under conditions of intense immune stress where they inhibit T and B cell function. We recently described the generation of immortalized MSC lines that provide a homogeneous source of suppressor cells for dissecting the mechanism of suppression. In this study we show that the MSC lines potently block in vitro proliferation of T cells stimulated with either mitogen or antigenic peptide, with as few as 3% of MSC cells causing complete suppression. Inhibition of mitogenic and peptide-specific responses is not associated with a loss in IL-2 production or inability to up-modulate the early activation markers, CD69 and CD25, but results in direct impairment of the three IL-2R signaling pathways, as demonstrated by the lack of Janus kinase 3, STAT5, extracellular signal-regulated kinase, and Akt phosphorylation in response to IL-2. Suppression is mediated by and requires NO, which is secreted by MSC in response to signals from activated T cells, including IFN-γ and a contact-dependent stimulus. Experiments with inducible NO synthase knockout mice demonstrated that the inhibition of T cell proliferation by CD11b+Gr-1+ cells in the spleens of immunosuppressed mice is also dependent upon NO, indicating that the MSC lines accurately represent their normal counterparts. The distinctive capacity of MSC to generate suppressive signals when encountering activated T cells defines a specialized subset of myeloid cells that most likely serve a regulatory function during times of heightened immune activity. We and others have shown that cells with an immature myeloid phenotype accumulate in the spleens and lymph nodes of tumor-bearing mice, where they inhibit Ab production, CTL generation, and lymphocyte proliferative responses (1, 2, 3, 4, 5, 6, 7, 8, 9). The myeloid suppressor cells (MSC)3 morphologically resemble granulocyte-monocyte progenitor cells and express the granulocyte-monocyte markers CD11b (Mac-1) and Gr-1 (Ly-6G) (10). We have previously reported that the accumulation of MSC in the spleens of tumor-bearing mice correlated with the release of GM-CSF by the tumor cells and was simulated by administration of GM-CSF to normal mice (1, 3). Although MSC may deleteriously suppress antitumor responses (11, 12), they also accumulate in the spleens of mice undergoing graft-vs-host disease (13); in the lymphoid organs of mice infected with viral vaccines (10), bacteria, and parasites (14, 15, 16); and in the spleens of mice treated with superantigens (17), where they probably restrain overwhelming immune responses. Several soluble mediators, including inhibitory cytokines, PGs, reactive oxygen intermediates, hydrogen peroxide, and NO, have been implicated in the suppressive mechanism (3, 5, 6, 11, 13, 18, 19, 20, 21, 22, 23, 24, 25), of which NO appears to be particularly important (3, 5, 6, 11, 13, 17, 18, 26). In myeloid cells NO is produced by the enzyme, inducible NO synthase (iNOS), during the conversion of l-arginine to l-citruline; iNOS message and protein are induced by a number of cytokines, including IFN-γ and TNF-α in macrophages and in some macrophage lines. Because homogeneous populations of MSC are difficult to isolate in large numbers from mice, we have taken the approach of immortalizing MSC to generate cloned cell lines. In a previous report (27) we isolated Gr-1+CD11b+ cells from the spleens of mice that were immunosuppressed by tumor or virus and infected them with a retrovirus encoding the v-myc and v-raf viral oncogenes. Cloned lines obtained from these cells lost expression of Gr-1 in culture but did express several monocyte/macrophage markers such as CD11b, F4/80, CD86, and CD11c. All cloned lines retained the capacity to inhibit T cell proliferation and the generation of alloreactive CTL, in contrast to several phenotypically similar macrophage lines that lacked this function. In this paper we have examined the mechanism by which these cells block T cell activation. In vitro experiments as well as studies using iNOS knockout mice clearly show that NO plays a critical role in the suppression of immune responses by MSC lines. NO operates at the level of the IL-2R signaling pathway, inhibiting Janus kinase (JAK)1 and JAK3, STAT5, extracellular signal-regulated kinase (Erk), and Akt activation by IL-2. The secretion of NO by MSC lines is tightly controlled, requiring surface and soluble signals from activated T cells. As such, MSC serve as sensors for T cell activation and differ from nonsuppressive macrophage lines, which fail to release NO when encountering activated T cells. The generation, culture, and phenotypes of MSC lines have been described previously (27). Briefly, adherent Gr-1+CD11b+ cells were isolated from the spleens of BALB/c mice that were found to be immunosuppressed during the growth of the mammary adenocarcinoma TS/A tumor or following immunization with an IL-2-producing recombinant vaccinia virus (10). These cells were immortalized with a retrovirus encoding the v-myc and v-raf oncogenes, and cell lines designated MSC-1 and MSC-2 were established from the tumor-bearing and vaccinia-treated mice, respectively. The two lines were cloned by limiting dilution, and one representative clone from each line was used throughout this study. The control BALB/c alveolar macrophage line, MH-S, was obtained from American Type Culture Collection (Manassas, VA). Single-cell suspensions were prepared from spleens of 6- to 12-wk-old female mice, and RBC were removed with ACK Lysing Buffer (Biofluids, Rockville, MD). BALB/c splenocytes (4 × 105 cells/well) were stimulated with 5 μg/ml Con A (Sigma-Aldrich, St. Louis, MO) in the presence of irradiated (60 Gy) MSC lines or MH-S cells (syngeneic to the responder cells). Assays were performed in 96-well plates, 200 μl/well in RPMI 1640 containing 10% FCS, glutamine, antibiotics, and 55 μM 2-ME. Unless stated otherwise, the numbers of MSC or MH-S cells were 3% of the total number of splenocytes. After 1 or 2 days of stimulation with Con A, cells were pulsed for 16 h with 5 μCi/ml [3H]thymidine, harvested with a Tomtec harvester (Tomtec, Orange, CT), and counted using a beta scintillation counter. Data are expressed as counts per minute (mean ± SE) of triplicate cultures. In some experiments splenocytes from DO11.10 TCR-transgenic mice (BALB/c background), specific for chicken OVA peptide residues 323–339 in the context of I-Ad (28), were used as responders. Splenocytes (4 × 105/well) were stimulated in the presence or the absence of MSC lines with 1 μM antigenic peptide for 2 days and then pulsed with [3H]thymidine as described above. Some experiments were performed in 24-well Transwell plates (Costar, Cambridge, MN) in a final volume of 800 μl. Splenocytes (1.8 × 106/600 μl) were in the lower compartment of the well, and MSC lines or MH-S cells (0.54 × 105/200 μl) were in the upper compartment. Cells were cultured with Con A for 2 days, then pulsed with [3H]thymidine as described above. Where indicated, 200 Cetus units/ml human rIL-2 (Hoffmann-LaRoche, Nutley, NJ) or 0.2 mM NG-monomethyl-l- and d-arginine (l- and d-NMMA; Alexis, San Diego, CA) were added to cultures. Neutralizing anti-mouse IFN-γ mAb (clone 37895.11; R&D Systems, Minneapolis, MN) was used at 30 μg/ml. Cells were surface stained using the following mAbs: PE-anti-CD25 (IL-2R α-chain), PE-anti-CD132 (cytokine common γ-chain), FITC-anti-CD122 (IL-2R β-chain), FITC-anti-CD69, PE-anti-Gr-1, and FITC-anti-CD11b. All mAbs were purchased from BD PharMingen (San Diego, CA), except for the anti-CD25 (Caltag Laboratories, Burlingame, CA). Staining was performed in the presence of saturating levels of the anti-FcR mAb, 2.4G2 (BD PharMingen). Ten thousand cells were acquired for each sample with a FACScan flow cytometer (BD Biosciences, San Jose, CA). Dead cells were gated out based on their scatter properties. For cell cycle analysis, cells were fixed in a 0.5% formaldehyde solution in HBSS for 15 min at 4°C, washed once in HBSS, and incubated overnight at 4°C in 0.1% sodium citrate and 0.1% Triton X-100 containing 25 μg/ml propidium iodide and 0.1 mg/ml RNase A. Twenty thousand cells were acquired for each sample. Doublets and other aggregates were gated out using the BD Biosciences Doublet Discrimination Module. Levels of IL-2 or IFN-γ in culture supernatants were assayed using ELISA kits from BioSource International (Camarillo, CA) and R&D Systems, respectively. The detection limit was 13 pg/ml for IL-2 and 2 pg/ml for IFN-γ. Treatment of MSC lines or MH-S with IFN-γ was performed in 24-well plates. After irradiation, cells (0.54 × 105 cells/800 μl) were stimulated with titrated amounts of recombinant mouse IFN-γ (PeproTech, Rocky Hill, NJ), and after a 48-h incubation at 37°C NO levels were measured in supernatants. NO production was measured as the nitrite concentration using the Griess assay. Supernatants (100 μl) were added to 100 μl of a 1/1 mixture of 1% sulfanilamide dihydrochloride and 0.1% naphthylethylenediamine dihydrochloride (Sigma-Aldrich) in 2.5% H3PO4. Plates were incubated at room temperature for 10 min, and absorbance at 550 nm was measured using a microplate reader. Nitrite contents were calculated with reference to a sodium nitrite standard curve. The detection threshold was 1 μM. In some studies, nylon wool-enriched T cells (∼75% CD3+) were cultured for 24 h with Con A and MSC, for an additional 4 h with MSC in the absence of serum and Con A, followed by 15 min with or without human rIL-2 (200 U/ml). In other experiments T cells (>95% CD3+) were negatively selected from lymph nodes using anti-mouse Ig-coated magnetic beads (Polysciences, Warrington, PA). After 2-day stimulation with Con A, cells were washed in CO2-acidified RPMI 1640 to remove bound cytokines, rested for 24 h in RPMI 1640 plus 1% FCS, treated for 2 h with 350 μM S-nitroso-N-acetylpenicillamine (SNAP; Molecular Probes, Eugene, OR) or with an equivalent volume of solvent (DMSO), and incubated for 5 min with or without IL-2. In both cases lymphocytes were lysed for 10 min on ice with 0.4% Nonidet P-40 in 20 mM Tris-HCl (pH 8), 10% glycerol, 50 mM NaF, 2 mM EDTA, 137 mM NaCl, 1 mM PMSF, 10 μg/ml leupeptin, 10 μg/ml aprotinin, and 1 mM Na3VO4 and clarified by centrifugation. Aliquots containing 200 μg of protein (Bio-Rad Protein Assay; Bio-Rad, Richmond, CA) were precleared and immunoprecipitated using Ab bound to protein A- or protein G-Sepharose. Immunoprecipitates were resolved by 6% SDS-PAGE, transferred to a nitrocellulose membrane, and Western blotted first for the phosphorylated protein, then after stripping in 0.1 M glycine, 0.1% SDS, and 1% Tween 20, pH 2.2, for 1 h at room temperature for total protein. For Erk1/2, Akt, and STAT5, 30 μg of lysate were Western blotted directly. Proteins were detected by ECL (Amersham Pharmacia Biotech, Piscataway, NJ). The following Abs were used for immunoprecipitations: rabbit anti-STAT5b (R&D Systems), anti-JAK3 mAb (Upstate Biotechnology, Lake Placid, NY), and anti-JAK1 mAb (Transduction Laboratories, Lexington, KY). The following Abs were used for blotting: HRP-PY-20 anti-phosphotyrosine (for phospho-STAT5b; Santa Cruz Biotechnology, Santa Cruz, CA), rabbit anti-STAT5b (R&D Systems), 4G10 anti-phosphotyrosine (for phospho-JAK3; Upstate Biotechnology), rabbit anti-phospho-JAK1 (Calbiochem, San Diego Ca), rabbit anti-phospho-mitogen-activated protein kinase (MAPK) (Erk1/2; New England Biolabs, Beverly, MA), rabbit anti-Erk1 (Transduction Laboratories), rabbit anti-phospho-Akt (Thr308) rabbit anti-Akt (New England Biolabs), rabbit anti-JAK3 (Upstate Biotechnology), anti-JAK1 mAb (Transduction Laboratories), and rabbit anti-phospho-STAT5 (Zymed Laboratories, San Francisco, CA). HRP anti-rabbit or anti-mouse Ig were used as developing reagents. Four- to 6-wk-old B6;129P-Nos2tm1Lau (iNOS−/−) female mice and B6129PF2/J wild-type (wt) controls were purchased from The Jackson Laboratory (Bar Harbor, ME). Recombinant mouse GM-CSF (PeproTech) was administered twice a day over a 3-day period (5 μg/mouse i.p. twice daily). Splenocytes were then collected, and their phenotype and proliferative responses to Con A were determined as described above. Data were analyzed using Student’s t test. Values of p < 0.05 were considered insignificant. To assess the inhibitory capacities of MSC lines, BALB/c splenocytes were treated with Con A in the presence of titrated numbers of MSC. As shown in Fig. 1⇓A, cloned MSC potently inhibited proliferation, with as few as 3% of cells causing complete suppression. By contrast, cells from the phenotypically similar macrophage line MH-S (and J774, not shown) were noninhibitory, indicating that not all myeloid lines are suppressive. In addition to their capacities to block mitogen-induced proliferation, the MSC lines were also effective inhibitors of peptide-specific responses (Fig. 1⇓B) as well as allogeneic responses, as shown previously (27). FACS analysis of propidium iodide-stained lymphocytes indicated that the MSC blocked proliferation of mitogen-stimulated T cells by preventing them from entering the cell cycle (data not shown). This block was observed after 24 and 48 h of stimulation and at 24 h was reversible, because splenocytes that had been stimulated with Con A for 24 h in the presence of suppressor lines retained the capacity to proliferate following removal of MSC (Fig. 1⇓C). Thus, during the first day of stimulation, the MSC lines induced an arrest in the cell cycle but did not kill the T cells. MSC are potent, reversible inhibitors of T cell proliferation. A, MSC inhibit mitogen-dependent T cell proliferation. BALB/c splenocytes were cultured for 2 days with Con A in the presence of titrated numbers of MSC-1 (•) and MSC-2 (○), after which proliferation was measured by [3H]thymidine incorporation. MH-S cells were used as a negative control (▾). An asterisk indicates proliferation in the absence of MSC or MH-S cells. Similar results were obtained in 10 independent experiments. B, Inhibition of peptide-specific responses. DO11.10 TCR-transgenic splenocytes were stimulated with 1 μM OVA323–339 peptide in the presence or the absence of 3% MSC or MH-S cells, as indicated. Incorporation of [3H]thymidine was measured after 2 days. Data are representative of seven different experiments. C, Reversibility of suppression by MSC lines. BALB/c splenocytes were stimulated with Con A for 3 days in the presence of no additional cells (Con A), MSC-1 cells (Con A + MSC-1), or MH-S cells (Con A + MH-S). Cells were cultured together for the entire stimulation period (filled bars) or cultured together for 24 h (hatched bars), after which splenocytes (nonadherent cells) were transferred (without washing) to a fresh plate and cultured for 48 additional h. Cells were pulsed with [3H]thymidine between days 2 and 3. Similar results were obtained using MSC-2 cells. Data are representative of three different experiments. We next asked whether MSC-mediated suppression occurs at early or later stages of T cell activation. 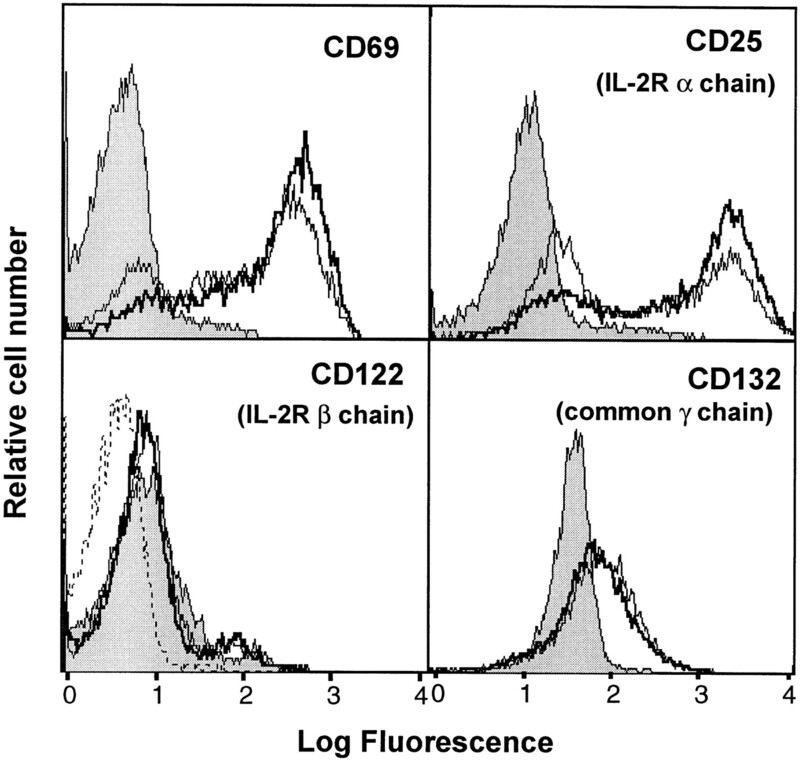 As indicators of early, TCR-dependent events, we measured IL-2 secretion and CD25 and CD69 surface expression. The data of Table I⇓ and Fig. 2⇓ show that the MSC lines do not block IL-2 secretion or CD25 and CD69 up-regulation, suggesting that MSC lines do not block the early stages of T cell activation. Therefore, we hypothesized that the MSC lines might operate at a later stage in activation, e.g., at the level of IL-2R signaling. To test whether limiting levels of IL-2 could account for the suppression, excess IL-2 was added on the first day of culture to Con A-activated splenocytes and suppressor cells; however, splenocytes still failed to proliferate (data not shown). Lymphocytes in both suppressed and control cultures expressed comparable levels of the three IL-2R subunits, CD25, CD122, and CD132 (Fig. 2⇓), suggesting that the site of suppression was downstream of the IL-2/IL-2R interaction. Three signaling pathways are known to be activated by IL-2: JAK/STAT, Ras/MAPK, and phosphoinositol 3-kinase/Akt (29). To evaluate whether there was an impairment in IL-2 signaling, T cells were stimulated with Con A in the presence or the absence of MSC-1 cells or control MH-S cells for 24 h, washed, and rested in serum-free medium for 4 h. Cells were then incubated for 15 min with rIL-2 and lysed, and representative proteins from each pathway were tested for activation. As shown in Fig. 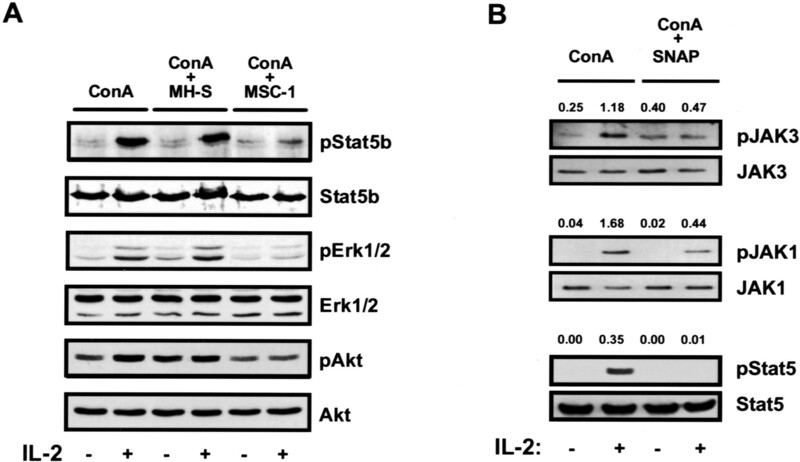 3⇓A, all three pathways were, in fact, impaired in MSC-suppressed T cells, as indicated by the lack of phosphorylation of STAT5b, Erk1/2, and Akt in response to IL-2. Stripping and reblotting with anti-STAT5b, anti-Erk1/2, and anti-Akt Abs indicated that equal amounts of protein were loaded in each lane. These data provide direct evidence that the MSC lines disrupt all known pathways activated by the IL-2R. T cells stimulated with Con A in the presence of MSC lines express early activation markers and all three chains of the IL-2R. Surface expression of the indicated markers was analyzed on nylon wool-enriched T cells after 24-h incubation with medium alone (filled histogram), Con A (thin line), or Con A plus MSC-1 cells (thick line). Background fluorescence is indicated with a dashed line in the CD122 panel. Similar results were obtained in five independent experiments with either MSC-1 or MSC-2 cells. Suppressed T cells fail to activate components of the IL-2 signaling pathway in response to IL-2. A, Nylon wool-enriched T cells were stimulated with Con A in the presence or the absence of MSC-1 or MH-S cells. The lymphocytes were then rested, treated with IL-2, and lysed. Cell lysates were analyzed for the presence of phosphorylated and total STAT5b, Erk, and Akt as indicated. Results are representative of three experiments performed with MSC-1 or MSC-2 cells. B, Activated T cells were treated with the NO donor, SNAP, or with solvent before stimulation with IL-2. Cell lysates were then tested for the presence of phosphorylated and total JAK3, JAK1, and STAT5. Numbers above each lane represent the ratio of intensities of bands of phosphorylated over total protein, determined by gel scanning and densitometric analysis. Because NO is known to be involved in immunosuppression in several systems, we asked whether it also plays a role in MSC-mediated suppression. As shown in Fig. 4⇓, a selective inhibitor of NOS, l-NMMA, reversed the MSC-mediated block of proliferation, while its inactive enantiomer, d-NMMA, had no effect. Reversal occurred in cultures activated with either mitogen (Fig. 4⇓A) or OVA peptide (Fig. 4⇓B), and relatively high levels of NO2−, an end product of NO decomposition, were detected in both types of culture (Table II⇓ and data not shown) when MSC lines, but not MH-S cells, were present. Moreover, addition of NO (in the form of the NO donor, SNAP) to the cultures at concentrations similar to those produced by the MSC resulted in blocked proliferation (data not shown) and impaired phosphorylation of proximal components of the IL-2 signaling pathway (Fig. 3⇑B). NO had the most dramatic effect on STAT5, but it clearly inhibited JAK3 and, to a lesser extent, JAK1 phosphorylation. Thus, NO is an essential component of MSC-mediated suppression, and NO by itself is able to mediate suppression. MSC lines suppress lymphocyte proliferation by an NO- and IFN-γ-dependent mechanism. A, BALB/c splenocytes stimulated with Con A. B, DO11.10 transgenic splenocytes stimulated with OVA323–339 peptide. Stimulated splenocytes were cultured with no additional cells, MSC-1, or MH-S cells. Portions of each of these cultures were treated with medium, l-NMMA, d-NMMA, or a neutralizing anti-IFN-γ mAb as indicated. After 2 days cells were assayed for [3H]thymidine incorporation. Results are representative of five experiments. Because IFN-γ up-regulates iNOS in several types of myeloid cells, we asked whether it was involved in the immunosuppression mediated by our MSC lines. As shown in Fig. 4⇑A, a blocking anti-IFN-γ Ab reversed suppression, indicating that IFN-γ is required for MSC-dependent suppression. Next, IFN-γ was added directly to the MSC to determine whether it would induce NO secretion. As shown in Fig. 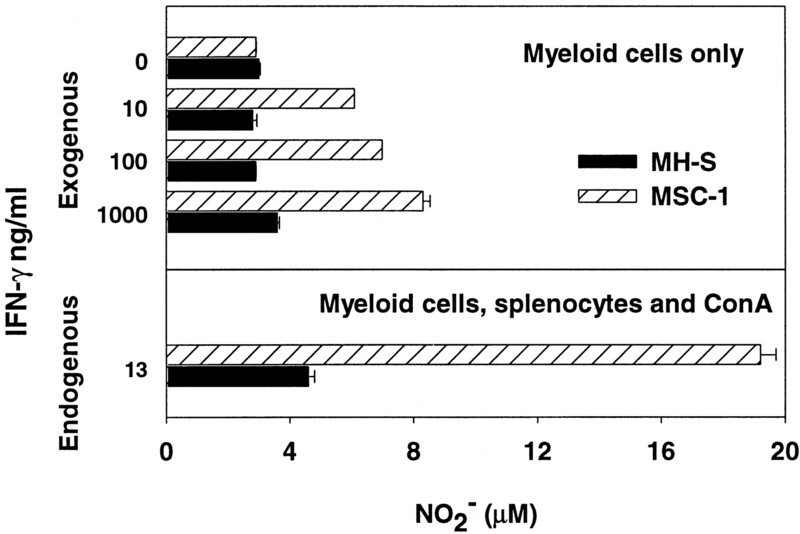 5⇓ (upper panel), IFN-γ did induce a dose-dependent release of NO from the MSC, but even in the presence of 1000 ng/ml IFN-γ, MSC released only half the amount of NO as when cultured with mitogen-activated splenocytes (Fig. 5⇓, lower panel), which, by comparison, produced 13 ng/ml IFN-γ. On the other hand, the MH-S line secreted lower levels of NO than the MSC at all concentrations of IFN-γ tested and did not show an increase in the mitogen-activated cocultures (Fig. 5⇓). Finally, we observed that the same neutralizing anti-IFN-γ mAb that reversed the MSC-dependent inhibition of proliferation by ∼50% (Fig. 4⇑A) also inhibited NO production by 30% (data not shown). IFN-γ triggers NO production in MSC lines, but not in MH-S cells. Upper panel, Irradiated MSC-1 or MH-S cells were cultured with the indicated amounts of exogenously added IFN-γ, and nitrite was measured in the supernatants after 48 h. Lower panel, Identical numbers of MSC-1 or MH-S cells as in the upper panel were cultured with splenocytes and Con A for 48 h, then nitrite and endogenous IFN-γ levels (13 ng/ml) were measured in supernatants. 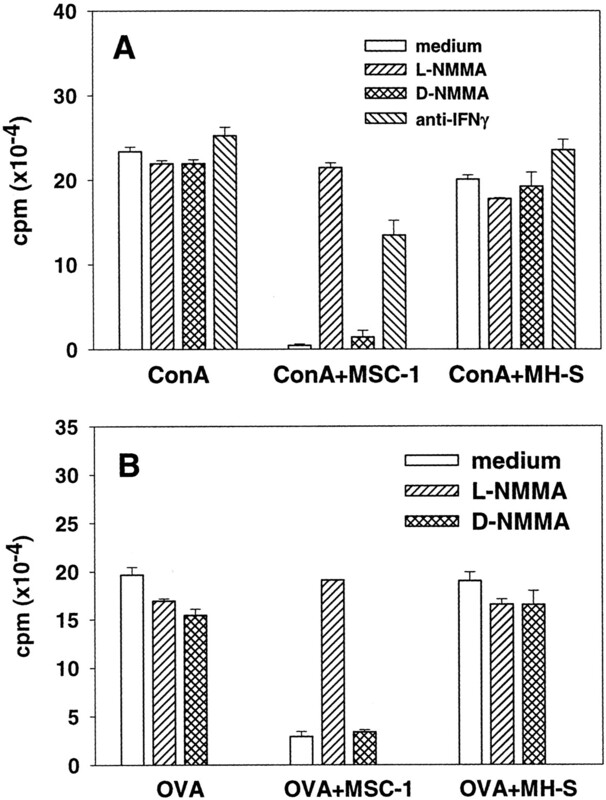 Treatment of MSC-1 cells with Con A in the absence of splenocytes did not result in nitrite production (not shown). Data (mean ± SE) are representative of three experiments. These data suggest that IFN-γ is required for NO production but that in the mixed cultures there are additional factors that boost the release of NO from the MSC lines. To determine whether these factors involve cell-cell contact, Con A-stimulated splenocytes and MSC were cultured in different compartments of Transwell plates, separated by a membrane that prevented direct intercellular contact while allowing diffusion of soluble mediators. Table II⇑ shows that despite the presence of similar levels of IFN-γ in both the same well and Transwell configurations, NO production and suppression of mitogenic responses occur only if MSC are physically in contact with lymphocytes. Thus, in addition to IFN-γ, other signals mediated by direct contact between MSC and lymphocytes are required to achieve the levels of NO required for suppression. In the above studies we used immortalized cell lines to show that immune suppression by CD11b+Gr-1+ MSC occurs by an NO-dependent mechanism. To determine whether this mechanism, in fact, applies to immunosuppressed mice, we treated iNOS−/− and wt mice with GM-CSF to induce the migration of MSC to the lymphoid organs (1). After 3-day treatment with GM-CSF, the percentages and numbers of CD11b+Gr-1+ cells were enhanced in the spleens of both iNOS−/− and wt mice relative to those in PBS-treated controls (Table III⇓). Despite the presence of comparable numbers of cells with the MSC phenotype in both iNOS−/− and wt mice, immunosuppression was observed only in wt mice (Fig. 6⇓). Thus, Con A-induced proliferation of splenocytes from wt, GM-CSF-treated mice was significantly lower than proliferation of wt splenocytes from mice treated with PBS. Moreover, addition of the iNOS inhibitor, l-NMMA, to splenocytes from wt, GM-CSF-treated mice significantly increased proliferation. By contrast, splenocytes from GM-CSF-treated, iNOS−/− mice proliferated normally in response to Con A, and l-NMMA had no effect on proliferation. These results confirm that NO is an essential component of immunosuppression mediated by normal MSC found in the spleens of GM-CSF-treated mice. Splenic MSC inhibit immune responses through an NO-dependent mechanism. 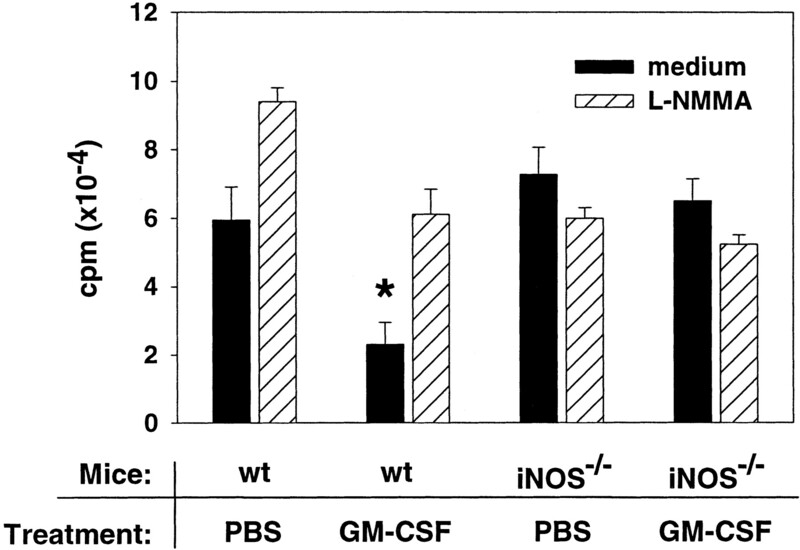 Splenocytes from iNOS−/− and wt mice that had been given medium (PBS) or GM-CSF were cultured with Con A for a total of 2 days, after which uptake of [3H]thymidine was measured. Filled bars represent cells cultured with Con A only; hatched bars represent cells cultured with Con A and l-NMMA. Data are from two independent experiments performed with three mice per group and are expressed as the mean ± SE. An asterisk indicates that Con A-dependent proliferation of splenocytes from GM-CSF-treated wt mice was significantly different from those in PBS-treated wt mice (p < 0.01), GM-CSF-treated wt mice in the presence of l-NMMA (p < 0.005), and GM-CSF-treated iNOS−/− mice (p < 0.005). Suppression of immune responses has been described in situations as disparate as tumor growth, graft-vs-host disease, infection with recombinant vaccines and parasites, and treatment with cyclophosphamide and superantigens. The common feature in all these conditions is the recruitment of Gr-1+CD11b+ myeloid cells to secondary lymphoid organs. Depletion and add-back experiments have demonstrated that in these situations, the Gr-1+CD11b+ myeloid cells are both necessary and sufficient for suppression of T and B cell responses. Previous studies using bulk populations of MSC have provided insights into the immunosuppressive process but have not defined the properties of a single, well-defined cell type. In the current paper we have used cloned MSC lines (27) to examine the immunosuppressive mechanisms used by homogeneous populations of suppressor cells. It is noteworthy that the cloned MSC are extremely potent inhibitors of T cell proliferation, but that inhibition, at least for the first 24 h, is reversible. Therefore, the immediate function of the MSC is to prevent activated T cells from entering the cell cycle without killing the cells. Presumably, the block in proliferation would eventually lead to apoptotic cell death, and, in fact, we have shown previously (27) that after a 5-day coculture, MSC lines induce apoptosis in a CTL clone as measured by annexin V binding. The MSC lines do not express many of the known death-signaling molecules, including Fas ligand (Fas-L), TNF-related apoptosis-inducing ligand, TNF-α, and lymphotoxin-β (27), and we have performed experiments in lpr mice that allowed us to exclude the involvement of Fas-Fas-L pathways in suppression induced by MSC in vivo (10). Moreover, an anti-TNF Ab failed to restore the myeloid-induced immune unresponsiveness. Therefore, apoptosis of T cells after prolonged suppression most likely results from the proliferative block rather than from a death signal mediated by Fas-L or TNF-α. The mechanism by which the MSC lines block mitogen and peptide-driven proliferation is well defined by our studies. The MSC lines do not impair the early events triggered by TCR cross-linking; in fact, suppressed lymphocytes release IL-2 and up-modulate activation markers such as CD25 and CD69. Instead, they prevent the IL-2R from transducing signals. Thus, although suppressed T cells express normal levels of the three subunits of the IL-2R, they fail to proliferate or activate STAT5, Erk1/2, and Akt, three components of the IL-2 signaling pathway (29), in response to IL-2. We have demonstrated that NO released by MSC is both necessary and sufficient to inhibit Con A and peptide-stimulated T cell proliferation. Evidence has been accumulating that NO modulates the biological functions of a number of intracellular signaling proteins (30) either directly by S-nitrosylation of critical cysteine residues (31) or indirectly by activation of guanylyl cyclase (32). Several kinases, including members of the JAK family, MAPKs, phosphoinositol 3-kinase, and Akt, have been reported to be sensitive to NO regulation (30), and it is likely that the MSC block T cell proliferation by acting upon multiple members of the IL-2 signaling pathway. One protein that is known to be affected by NO is JAK3, the kinase upstream of STAT5 in the IL-2R signaling pathway. In one study direct exposure of JAK3 to NO resulted in its oxidation and loss of enzymatic activity (33), and in another NO altered JAK3 activity through guanylate cyclase (34). Our results are consistent with either of these possibilities and further indicate that JAK1 is sensitive to regulation by NO. Because JAK1 and -3 are the first kinases in the IL-2 signaling pathway, it is also possible that all the effects of NO on components of the IL-2 pathway that we observed are due to the impaired activities of the JAKs. Synthesis of NO in macrophages is catalyzed by iNOS, whose expression is up-regulated by a number of cytokines, including IFN-γ, TNF-α, and IL-2 (35). Our data indicate that IFN-γ together with a cell-mediated signal from activated splenocytes are necessary for generating both the full suppressive activity of MSC and high levels of NO secretion. These signals are produced by activated T cells, and in the absence of an activation signal, T cells do not stimulate NO production in MSC (A. Mazzoni, unpublished observation). The cell surface interactions that increase NO secretion by MSC (but not MH-S cells) have not been defined. We have observed that an agonistic anti-CD40 mAb can synergize with IFN-γ to induce high levels of NO secretion by the MSC, as described in other systems (24, 36). However, ligation of CD40 by CD154 is not required for suppression, because 1) a blocking anti-CD154 mAb was unable to reverse suppression and 2) the MSC retained the capacity to suppress Con A-induced proliferation of splenocytes from CD154 knockout mice (A. Mazzoni, unpublished observations). Thus, we cannot say what role, if any, CD40 plays in the generation of NO by the MSC lines. An important question is whether the immortalized lines reflect normal myeloid suppressor lines. These lines were derived from cells that were clearly shown to be responsible for immunosuppression in vivo, and they retain their suppressive functions in culture. Moreover, they are phenotypically similar to splenic MSCs, although all MSC lines show small phenotypic differences from each other and from the primary MSC, possibly reflecting clonal variation within the bulk MSC population. However, the most convincing evidence that the MSC lines accurately reflect their normal counterparts comes from the iNOS knockout experiments. Our results predict that in cases where MSC mediate immunosuppression, such suppression would be lacking in iNOS-deficient mice. We found that cells with the MSC phenotype could be recruited to the spleens of iNOS−/− mice by repeated injections of GM-CSF, indicating that iNOS is not required for maturation or migration of these cells. However, as predicted, immunosuppression was not observed in the iNOS knockout mice, indicating that NO is an essential mediator of immunosuppression in vivo. Interestingly, in two autoimmune settings, experimental autoimmune encephalomyelitis (37, 38) and uveitis (39), the severity of the disease is increased in iNOS-deficient mice, suggesting once again the role of NO as negative feedback in the control of immune responses. Angulo et al. (24) have recently described a population of natural suppressor cells isolated from bone marrow that is very similar to our MSC lines in phenotype and function. Therefore, it is likely that the MSC are bone marrow derived, and that they leave the bone marrow and migrate to the lymphoid organs upon receiving an appropriate signal, one of which is GM-CSF. Interestingly, the migration signal need not originate from the lymphoid tissues and may derive from immune stress in peripheral tissues. Once the MSC arrive at the lymphoid tissues they can serve as sensors of T cell activation, producing NO in response activation signals, which, in turn, impairs the IL-2 signaling pathway, blocking T cell proliferation. The MSC appear to be a functionally distinct subset, in that other myeloid lines, such as MH-S and J774, corresponding to normal alveolar and splenic macrophages, respectively, fail to produce NO in response to activated T cells and therefore fail to block proliferation. It is also possible that MSC differ from other myeloid lineages in their capacity to enter lymphoid organs in response to intense immune stimulation and that their distinct suppressive capacity reflects their immature phenotype. In either case the unique capacity of MSC to populate lymphoid organs and block T cell proliferation in response to activation signals suggests that they play an important role in controlling immune responses during times of heightened immune activity. ↵1 This work was supported in part by the Italian Association for Cancer Research, Ministero dell’Istruzione dell’Università e della Ricerca, Istituto Superiore Sanità, Italy-U.S. Cooperative Program for the Therapy of Cancer (Grant T00.A17), and a fellowship from the Italian Foundation for Cancer Research (to E.A.). ↵3 Abbreviations used in this paper: MSC, myeloid suppressor cell; Fas-L, Fas ligand; iNOS, inducible NO synthase; JAK, Janus kinase; Erk, extracellular signal-regulated kinase; MAPK, mitogen-activated protein kinase; NMMA, N-monomethyl arginine; SNAP, S-nitroso-N-acetylpenicillamine; wt, wild type.